Last week I purchased an Acer Aspire One A110-1995 Netbook, running windows XP with all the service packs. I have yet to successfully connect to my wireless network. My network is a Linksys unsecured network. When I drive around the neighborhood I can connect to every unsecured network I find. Mine is the only one I have a problem with. When I view wireless networks in my range I always see my network at the top of the list with 5 green bars (says automatic). When I try to connect to mine, I get a box that says "Please wait while windows connects to the linksys network, waiting for network", then after about a minute, it goes back to the screen where I have to hit connect again. I had used MAC address filtering, but I get the same result whether it’s on or off. When I attach a cable from the Acer to my router, I can then see my network and connect to the Internet. I've made sure my wireless switch is set to enabled. MY main desktop PC is wired to the Linksys router. In addition, I have 2 desktop PC's, a laptop and a playstation 3 WIRELELY attached to the network with no problems. I am not a true technical person, so if someone has an idea, please pass it on in plain English. I hope I've given you enough info, please let me know if I haven't. Thanks in advance for any thought you can give to my problem. Ok from the quick view of it sounds like the wireless is shot on the linksys. Does anything connect to the linksys by wireless? The fact that you can connect to other wireless networks with your laptop helps show your laptop is fine. The fact that you can connect to the linksys with a cable shows that dhcp, settings and all that good stuff is fine on the linksys. So far the only thing really left is the wireless itself on the linksys. Now we can try setting different settings on the wireless, changing the channel and all that good stuff to see if it takes care of it. We can also make sure you have the latest firmware for it. But after we try those things and it still doesn't work then I would safely say the router will need replaced. But first lets get started. What is the model of your linksys? and what firmware version? I have a lot of linksys screenshots here on the site so feel free to compare with those. What Linksys Product(s) do you have? I counted 3 Desktop PCs, 1 Laptop, and 1 PS3 (Total of 5) items connected in a wired fashion. All the routers from Linksys that come to mind have only 4 ports so I'm thinking you have more than one? Can you give the specific model(s) of all routers, switches, and modems in your network? Since you've verified that your new netbook can connect to YOUR network on a wired connection and EVERYONE else's unsecured network then it's, as you've indicated, something with your Wireless AP (Access Point). I looked into the specs of your wireless card and it supports wireless G but doesn't support wireless N. There could be a chance that your AP is trasmitting a wireless N signal. Can you verify if this is the case or not? If it is then you need to log in to the AP (which is probably your router also) and change this. Another thing you can try is seeing if you can get any other devices to connect WIRELESSLY to your network. If you can (perhaps the PS3) that could give me some more details. If I haven't been clear about anything please let me know. We will get you working as soon as we can. Shane and Evan, Thanks so much for responding to my post. 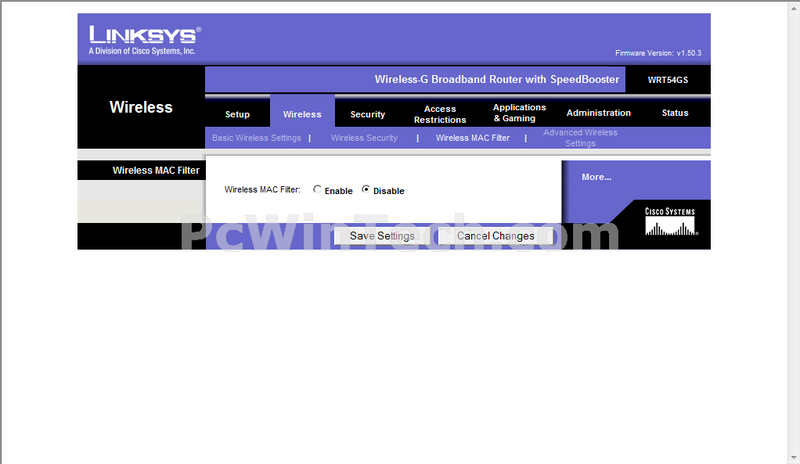 Regarding my router, Linksys WRT54GS Firmware: v4.71.1, Apr. 11, 2006. It seems I had a crucial misspelling that would have provided additional info. The sentence should have read "MY main desktop PC is wired to the Linksys router. In addition, I have 2 desktop PC's, a laptop and a playstation 3 WIRELESSLY attached to the network with no problems". The key here is that I have many devices wirelessly connected to my router. The Netbook was the only thing I could not make connect wirelessly. However, I did resolve the problem by looking at the Screenshots on your site. In the Linksys setup,Under Access Restrictions, Internet Access, I had toggled Enabled/Disable and that seemed to have no effect. But looking at the screenshots on your site, I noticed a setting "Wireless MAC filter" and you had it disabled. In my setup , I had it enabled, and as soon as I set it to "disable" the Netbook connected. I can't believe how simple the solution was once I was pointed in the right direction. However, I still don't understand it. Why could 4 other devices connect wirelessly with this setting enabled, and not the Netbook? you have to put in what mac addresses are allowed to connect to the wireless. So if you had the netbook's mac in there wrong or not at all it wouldn't connect. By using the mac filter you can leave your wireless unprotected and other people cant connect. But if I could recommend, please password protect your wireless. I had a customer complaining of slow speeds on their net. When I went over I logged into the router. looked at the local dhcp log of all the computers that had IP's. 64 computers had ips! I password protected her wireless and she had trouble since. I'm glad my site and screenshots where useful for you. If you need anything else just let me know. Thanks for the typo clarification. That makes more sense, lol. I agree with Shane about protecting your connection. The password keeps your data encrypted so even if you have MAC filtering on someone who really wanted to and knew how could intercept your data. You definately don't want that. I thought you said you had tried, initially, switching your MAC filtering on and off. If you did and what Shane said about having your MAC just slightly off could be answered by the fact that your Wired adapter and WireLESS adapter (thanks to your info from ipconfig) are two different devices with two different MACs. So maybe you had put in your MAC for the wired connection? Anyways, you're on now and I'm glad we could help. Just a side note....the numbers 32 and something over 100 are coming to mind as far as how many wireless connections the router can handle. I know those numbers are way different from each other but the point is 4 devices isn't the limit...though that might be a practical limit. Just depends on all the hardware. A car says it can go 140...doesn't mean you should do it, or so they say. Ask if you need anything else. Evan, you are EXACTLY right, I did put the wired MAC address instead of the wireless. You obviously have a good feel for all this networking stuff. I on the other hand fear it. Koolbrew's law, "if it can be screwed up, koolbrew will screw it up". I guess what I'm saying is that I don't want to get too technical because eventually I'll bring the whole network down. Adding password-protection to my network might sound simple to most, but it's one of those things that I'm just asking for trouble by trying it. You might as well ask me to take a sledge hammer to my router, because the results will be the same. Everyone has to know their limitations and I've learned mine the hard way. There is some security now, though, knowing how helpful this site can be. But I wouldn't want to take take time away from members who have real problems. My problems are self-created. Thanks again for all your advice. Dont ever worry about asking for help. Its the reason I made this site.